Indian communal worker; born at Alibag, near Bombay, in 1830; educated at the Robert Money School in Bombay. Samuel entered the service of the government in 1851, and was promoted to be second assistant to the inspector-general of ordnance at Puna. He was pensioned in 1878. During his period of service he succeeded in inducing the government to issue European rates of batta to the Beni-Israel soldiers. 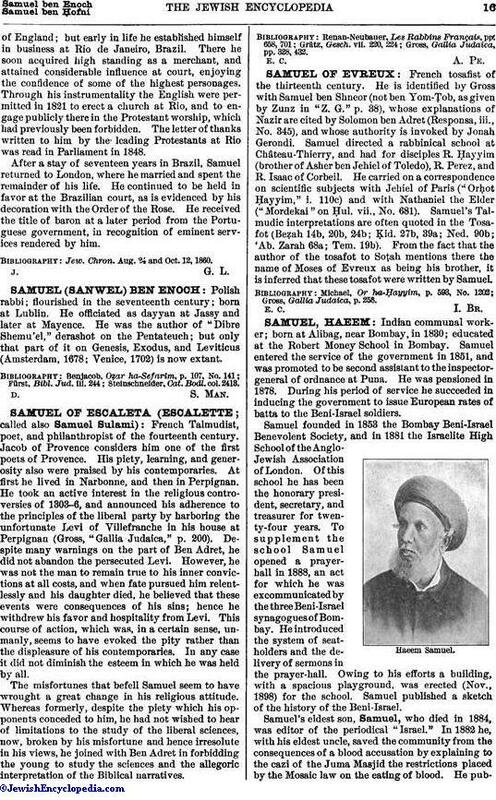 Samuel founded in 1853 the Bombay Beni-Israel Benevolent Society, and in 1881 the Israelite High School of the Anglo-Jewish Association of London. Of this school he has been the honorary president, secretary, and treasurer for twenty-four years. To supplement the school Samuel opened a prayer-hall in 1888, an act for which he was excommunicated by the three Beni-Israel synagogues of Bombay. He introduced the system of seat-holders and the delivery of sermons in the prayer-hall. Owing to his efforts a building, with a spacious playground, was erected (Nov., 1898) for the school. Samuel published a sketch of the history of the Beni-Israel. 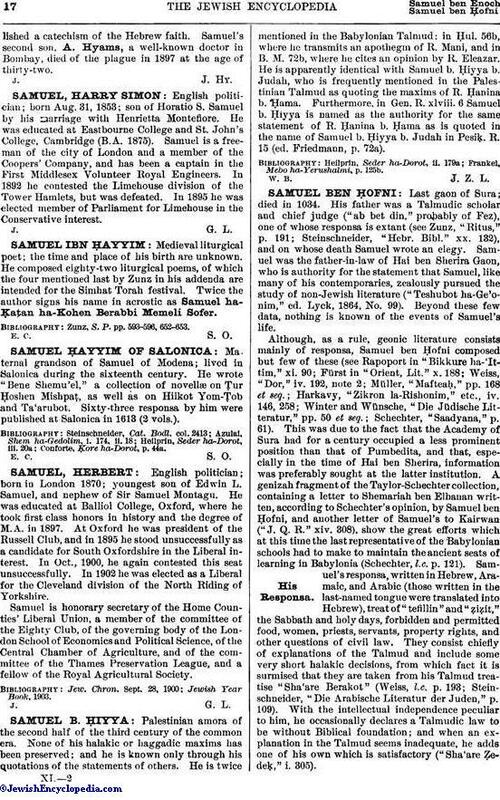 Samuel's eldest son, Samuel, who died in 1884, was editor of the periodical "Israel." In 1882 he, with his eldest uncle, saved the community from the consequences of a blood accusation by explaining to the cazi of the Juma Masjid the restrictions placed by the Mosaic law on the eating of blood. He publisheda catechism of the Hebrew faith. Samuel's second son, A. Hyams, a well-known doctor in Bombay, died of the plague in 1897 at the age of thirty-two.